Students and staff at the University of Mary Washington gathered together to celebrate a big win for a longtime cafeteria worker. Grace Anne Braxton's friendly face usually greets students from behid the Qdoba counter. She's been serving up a side of joy on the campus for 22 years. When she's not memorizing students' orders, you'll probably see Braxton cheering on the Eagles. “Positive. Just like a ray of sunshine and happiness,” basketball player Maddie Shifflett said. “I feel like everyone has their special relationship individually with her. Me, whenever I see her, I have a handshake with her I do,” basketball player Johnny Cronin said. But now the students are cheering on Braxton. 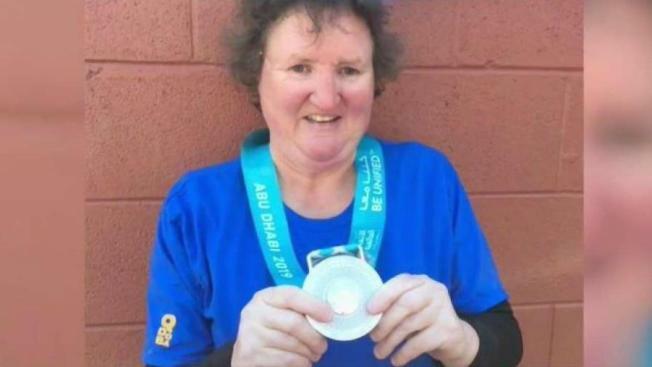 She won a silver medal in golf while competing in her fourth Special Olympics World Games. With the medal proudly hanging from her neck, she explained that she isn't ashamed of her intellectual disability. "It doesn’t bother me of who I am and what kind of disability I have," Braxton told News4. "As long as I get my job done, as long as I do what I have to do around here, it might take me a little longer to get things done, but as long as I can get them done, I feel fine about it because that’s who I am,” Braxton said. “She doesn’t feel different here. She’s just like everybody else. That’s how I want her to feel,” Braxton's supervisor Kiesha Childs said. Childs has been Braxton's manager for 16 years and teared up while explaining how much she means to the UMW community. “We’re a family here and we love her, and I do,” Childs said. And Braxton certainly felt that love when she walked outside to find a huge crowd chanting for her and reveling in her victory. “If I had to go back to do another job, I wouldn’t. I would stay right here. Because this is my community and this is where I belong,” she said.